A condensate pump is a specialized device intended for use in transferring condensate (water) produced in an industrial steam system. 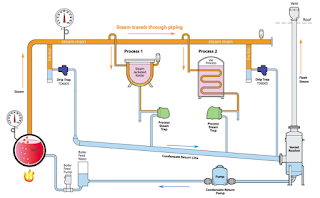 Condensate from a heating system or process is collected, then pumped to the condensate return system, where it is routed back to the boiler for reuse. In certain cases, the steam pressure of the system may be sufficient to push the condensate through the steam traps and condensate return lines, back to the condensate holding tank in the boiler room. In most practical situations, however, one or more condensate return pumps are required to assist in overcoming gravity, pressure drops from long piping runs, and back pressure in return lines. Condensate Return Pumps are either electrically-driven centrifugal pumps or non-electric mechanical pumps that use steam pressure as the motive force to pump the condensate. Non-electric pumps are referred to as Pressure Motive Pumps (PMPs). A facility will often have a separate area that contains various components required for the generation of steam, such as a boiler, condensate holding or deaerator (DA) tank, boiler feed pump, water treatment, etc. Regulated by the boiler control system, the boiler feed pump sends condensate from the holding tank back to the boiler. Pressure Motive Pumps (PMPs) are non-electric pumps which return condensate back to the boiler room; using steam pressure as the motive force. PMPs can be supplied as stand-alone units – which include a pump tank, the internal operating mechanism, and a set of inlet and outlet check valves, or: as a packaged system – which also includes the vented receiver tank (to collect the condensate) mounted on a common base. 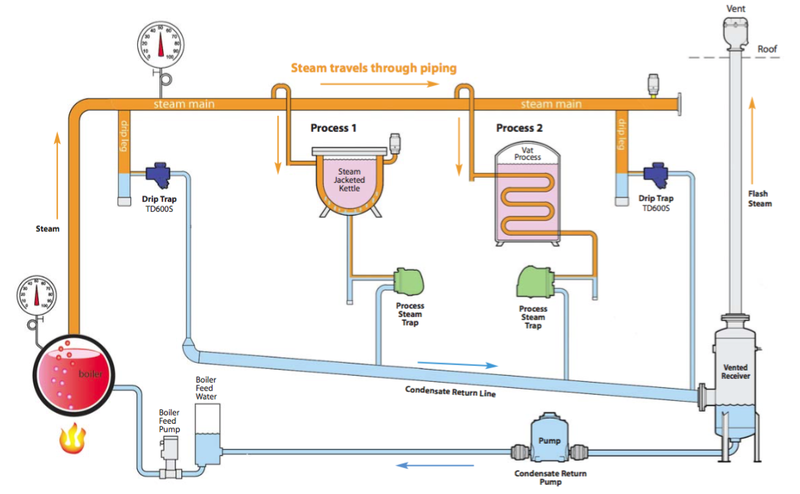 The following is a comprehensive document, courtesy of Watson McDaniel, that provides a good general understanding of steam and condensate systems, traps and condensate pumps.